​through education and community involvement. Dragonfly Aerial Arts Studio is run by artists and trained instructors who both teach and perform. 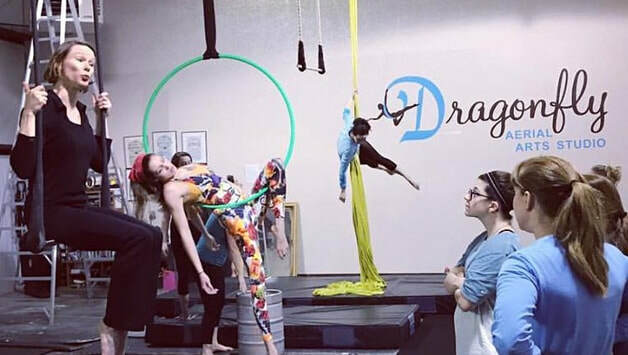 Started in 2010 by 6 local aerialists, Dragonfly offers the Knoxville area classes in the circus arts for everyone of any fitness level AS WELL AS the opportunity to book trained and passionate professional performers for festivals and special events! At Dragonfly, you will increase physical fitness and self-confidence through an activity normally found only in larger metropolitan areas. We offer you the perks of big-city circus fun right in your home town! Through these circus activities, Dragonfly helps you improve your body, mind, and spirit in a safe, encouraging, and fun environment! Dragonfly Aerial Arts Studio is a 501(c)3 nonprofit organization that is committed to improving the lives of those in the Knoxville community. We share the health and wellness benefits of circus arts with at-risk and underprivileged youth through our community outreach programs, tuition scholarships, children’s circus camp and classes, and annual circus extravaganza. We believe that the circus is a home for everyone. Dragonfly creates a space where every student is celebrated for their uniqueness and can express their creativity. We are always seeking partnerships with community groups and clients who wish to benefit from the unique creativity and discipline learned through the circus arts! Click here to learn how to partner with us! Dragronfly Aerial Arts and One World Circus have been visiting the Community Law Office outreach program for over four years now. Every time Jake and Lissa visit the CLO we are transported to another world where anything is possible! Where else could you walk on stilts or fly on an aerial trapeze? It’s one thing to go see a circus, but entirely different to interact and be part of a circus. What Dragonfly offers is so unique and empowering. The students always have a fantastic time!